Kevin Massey performing during the Disney on Broadway series at Epcot’s International Festival of the Arts. Over on the Disney Parks Blog a story was recently released detailing special entertainment coming to the Disney Magic, Disney Fantasy, and Disney Wonder this summer and fall. Stars Set Sail is a live concert series that features the extraordinary talents of Disney on Broadway singers. The setup is quite similar to that of the highly popular Disney on Broadway concert series, which made its debut at this year’s Epcot International Festival of the Arts, featuring many of the same artists – including one of my personal favorites, Josh Strickland. If you’ve never experienced a Disney on Broadway production, prepare to be mesmerized and moved by these powerful and emotion-filled performances. A full list of artists is available on the Disney Parks Blog site. Our friend Scott Sanders of the Disney Cruise Line Blog posted the details of a DVC Member Cruise, which will be sailing in July of 2018. For more information regarding itineraries and point values, as well as booking instructions, visit the DCL Blog. The sailing will include TWO stops at Castaway Cay, which means you’ll have two full days to explore Disney’s private island paradise! Cruisefever.net has an interesting article looking at the cleanliness ratings for each cruise line that sails in or out of any U.S. port. An unannounced inspection is performed by the Vessel Sanitation Program, which goes through a 44-point checklist encompassing all aspects of the ship. Unsurprisingly all four Disney Cruise Line ships achieved a perfect score of 100. In my multiple cruise experiences with Disney Cruise Line one thing that has always stood out to me is the stellar level of cleanliness and attention to detail by the on-board staff. This perfect score is a testament to the hard work of the crew that is ever-present when on a Disney ship. My niece having her own sail away party on the Shuffleboard lanes. The Disney Parks Moms Panel has offered up a few excellent tips for families sailing with small children. Detailing what to pack, activities to experience on-board, and tips for before you cruise, the Moms explore ways to make the best of yours and your children’s vacation. As always, you can contact the experts of the Disney Parks Moms Panel for further tips and information. 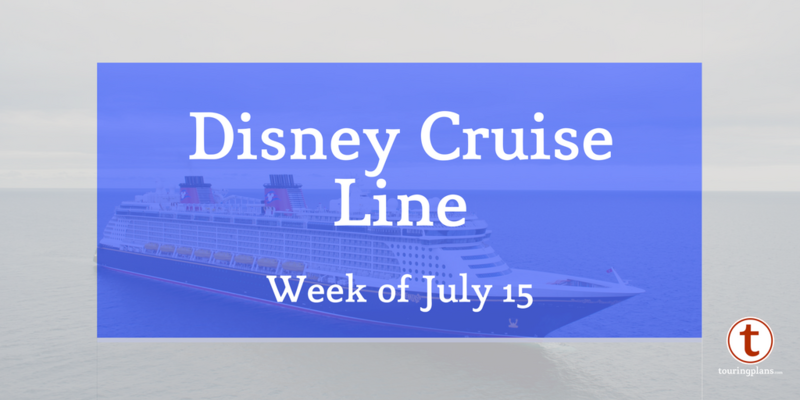 Julia Mascardo from our Best Week Ever series alerted me to a new feature being offered on the Disney Cruise Line website. For guests looking to experience the mixology or beverage tasting courses aboard the ship, they can now be booked online ahead of time. Now this is one activity I’ve yet to experience, but everyone that has mentioned it to me gives it nothing short of high praise. Tastings available include beer, wine, whiskeys, and spirits, priced at $20 to $25 for an hour-long seminar. It is recommended to take advantage of the early online booking as the seminars are quite popular. Being the inaugural sailing of this blog, I think it’s fitting to pass along the first tip I was given when boarding my first cruise. My aunt worked for Disney Cruise Line as a coordinator at Port Canaveral, so naturally I had her accompany me as I boarded the Fantasy. As we reached the atrium, she leaned over and said “make sure you go right to Cabanas, you’ll thank me later.” Five plates of shrimp and crab legs later, I knew immediately that this was going to be a fantastic voyage. With that said, when boarding the ship you have many options to explore, but in this author’s opinion there’s no better way to start a cruise than with a Kobayashi-esqe run through the buffet. Characters. We all love them. So much so, that we’re willing to spend hours waiting in line to get autographs, selfies, or hear Mickey say “Hiya, Pal!” It’s no surprise that Disney Cruise Line would have a hall-of-fame-worthy collection of characters to meet on board – Captain America, Jack and Sally, even The Fab Five! But this is where a useful tip comes into play. The procedure for certain meet and greets onboard has changed recently to where you must now obtain a return time in order to meet some of the characters – for example, the Princess Gathering featuring Rapunzel, Tiana, Cinderella, and Ariel, or a meet and greet with Anna and Elsa. This can be done online, just like booking adult dining or a port excursion, or upon entering the ship, based on availability. (Information about where to sign up for meet and greet tickets will be available in your Navigator on embarkation day.) As with FastPass, you will return to the atrium or other location specified on your return tickets during your given time to meet the characters as you would normally. Cupid’s arrow won’t be needed to fall in love with the design of the whimsical Enchanted Garden aboard the Disney Dream. If you’re like me, you’re constantly asking yourself “What’s for dinner? !” The good news is that you will never go hungry on a Disney Cruise. Food is literally available everywhere, at all times of the day. From quick service windows, to the Cabanas breakfast and lunch buffets, the three main dining rooms, as well as signature favorites Remy and Palo, every palate is well represented. 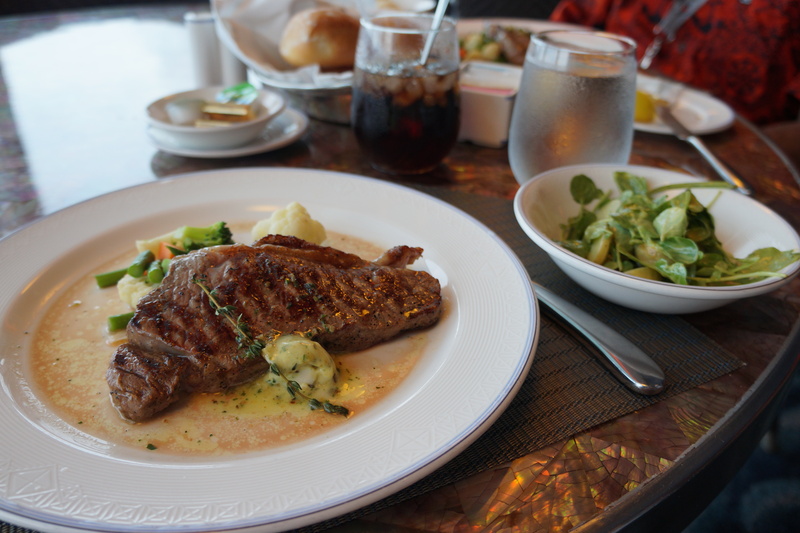 A couple noteworthy dining tips: Remy (on the Disney Dream and Disney Fantasy)and Palo (on all four ships) require reservations, as well as an extra cost per person. Reservations are recommended to be made prior to your cruise, as they are both popular offerings. For dinner reservations you will need to choose which restaurant you replace for dining at Palo or Remy. Something to consider is making sure you visit the restaurants on your wish list. You can make necessary changes, such as dinner time or order of restaurants (pending availability), simply by visiting guest services in the atrium. I won’t give any spoilers here, but Animator’s Palate is a must-do for any first-time cruiser. A screenshot from the official Disney Cruise Line app showing functions of the Personal Navigator. While on board, you’re going to need pertinent information for each day’s activities. Unfortunately I can’t cruise along with you, due to an “unauthorized field trip” – actually, my laptop cord wouldn’t reach that far. The good news is every morning you’ll wake up with a Personal Navigator delivered to your stateroom, which lists the activities and happenings of the day, including: weather, movie times, special activities, and more! One evening after leaving a fine meal at Royal Palace, I noticed a three-point basketball contest on the Navigator. So in full Brand Glover signature Sport Coat, Oxfords, and tie, I ran up to the court. (How’d I do? Lets’ just say that I wouldn’t have made fellow TouringPlans author Brian McNichols proud with my lackluster jumper). This is just one example of how useful the Navigator can be, because you may just find something of interest to you that will make for a fun memory. And for the tech savvy, the official Disney Cruise Line app contains a digital version of the Navigator as well as menus for the main dining room dinners, and a texting function available over the ships on-board Wi-Fi. Apps, Navigators, what else can we throw into the mix?! That brings us to your room key. Use it, protect it, take it with you everywhere you go, because all on-board purchases and charges at Castaway Cay (for merchandise and drinks) will be made with your room key. Sounds so simple, right? Whether you’re shopping for items in the stores that will become future features of our The Magic, The Memories, and Merch article, or buying your new friends a round at one of the many bars on board, you’ll charge it to your room via your room key. The same is true for Castaway Cay: all bars, stores, and kiosks accept payment via room key. The one exception is the Castaway Cay Post Office, where you can mail a letter back home, making all of your friends jealous of your time on vacation. You’ll need to bring cash (U.S. dollars are accepted) to pay for the postage, which includes a special postmark from Castaway Cay. The Castaway Cay Post Office, as decorated during the 2013 holiday season. While we’re mentioning this charted desert isle, it’s worth noting some of the unique experiences available to all guests. Starting with my favorite, you can rent a bicycle and tour the island, which includes an observation tower as well as a runway that was used earlier in the past century for bootlegging purposes. If you prefer to run, you can follow in the footsteps of two-time runDisney champion and author of The Saturday Six Derek Burgan by completing the Castaway Cay 5k. The best part? It’s included in your vacation, meaning FREE! And one more little addition to that: if you’re running the 5k, you’ll be disembarking the ship earlier than the rest of the guests. So that would give you a head start on finding a hammock in the shade. Run fast friends! One of the absolute coolest features of the Island for theme park fans is located under the sea…20,000 leagues to be exact. Ok so it’s not THAT deep, but what I’m referring to is a 20,000 Leagues Under the Sea Nautilus, which was the vessel that carried guests through the former Magic Kingdom attraction. Bring your underwater camera and snorkel gear because you can swim right up to and explore the Nautilus. I’ve even heard reports that a small octopus lives somewhere in the vicinity of the Nautilus, so be on the lookout for eight-legged sea friends and more! Your reminder to pack (or rent) snorkel gear! With that, it’s time to return to port in order to prepare for next week’s article. I hope you’ve found this informative, but if not my name is Derek Burgan and you’ve been reading The Saturday Six. Be sure to check out our latest masterpiece exploring the WORST Places to Propose at Walt Disney World! Special thanks to Derek, my better half Adrian Rowda, Julia of Best Week Ever fame, and the always stylin’ and profilin’ Scott Sanders of the DCL Blog for their assistance on this article. If you are cruising for the first time, bring a lanyard around with you to carry your room key. Doesn’t have to be Disney, although they do sell them on board. For any cruise after your first, they will provide you with a lanyard. So glad that they have the tastings now available for booking prior to leaving! That was always a bit of a mystery as to when they would be and how that would fit in with the rest of your schedule. I have had to do them back to back with a Princess Gathering, which wouldn’t have been my choice. Luckily, the Princess Gathering was first. You don’t have to be athletic to do the 5 km on Castaway Cay. People walk, jog, run – all types of activity levels. I saw someone run with flip flops, pulling a suitcase along with them! It is very hot though, so just keep that in mind! I bought a lanyard from Mickey’s Main Sail on my first cruise, which has a wallet on the end, and it has come in handy on every cruise since! It definitely makes things easier for those who enjoy pre-planning such as myself. The 5k is fun for everyone, best to do at an enjoyable pace. I’ve had a friend push a stroller though the course! Definitely good to know that they have water stops on the course as well. Thanks for reading! Great post! Just FYI, that’s not Josh Strickland:) It’s Kevin Massey. I need to start labeling my photos better 🙂 thank you for reading! Great blog Brand! Looking forward to seeing more of your work. Here’s my tip-bring an old hotel room key card or spent gift card or something along those lines, and either attach a magnet to one end or bring a magnetic clip like the ones you can put on the fridge. On the Dream and Fantasy (not sure about the Magic and Wonder) the lights in your room have a slot that needs something put into it to turn on as a energy saving feature. It’s intended for you to put your room key in, but I found it much easier to have a spare card hanging on the door next to it. I never had to fumble for the card, and cut down the chances that I would accidentally lock myself out of the room if I was just leaving for a few minutes, like to switch a load of laundry or to run up to get a drink from the pool deck. This is an excellent tip, Kelly! I will definitely consider this for my next cruise, as I am prone to removing the key and turning everything off at least twice a day per trip.